Darrell Issa trolls Democrats for "walking out" on Benghazi testimony. With this thumb I thee tweet. It went largely unnoticed, but the House of Representatives held three hearings on the Benghazi debacle this week. The most revelatory, as Stephen Hayes reports, was a Thursday morning grilling of the authors of the State Department’s Accountability and Review Board report, who concluded (as Leon Panetta concluded) that the real-time response was adequate but in vain, given the shoddy organization leading up to Sept. 11, 2012. As Hayes reports, “the ARB did not speak with nine key military officials on the ground in Libya or Germany who were deeply involved in the US response to the attacks,” not even Lt. Col. Steven Gibson, who is credited with getting a “stand-down” order that the administration disputes. Good stuff, all sort of overwhelmed by the trick Darrell Issa pulled after that testimony. After the ARB testimony, which helped build the Republicans’ case, the parents of two Benghazi martyrs were called in for their testimony. Pat Smith and Charles Woods, who’ve appeared in other media to shame Congress and the president for not working hard enough on Benghazi, called on the lower house to call more witnesses. If the House decides to create a special select committee—something leadership hasn’t ruled out—we’ll surely hear more from these parents. Faced with them, the five Republicans and two Democrats who stuck around the Oversight Committee basically one-upped each other on pathos, with South Carolina Rep. Trey Gowdy putting in a eulogy/apology worthy of Tennessee Williams. At some point during these testimonies, an Issa staffer stood at the back of the room and took a photo, revealing how few Democrats were there. Issa tweeted this, twice. Notice how Issa softened the accusation in the second tweet—from all “Oversight Dems” to all but two. Didn’t matter—the story rocketed around conservative media that, as Fox News put it, Democrats were “spitting on the graves” of Benghazi victims by not sitting for the parents’ testimonies. Just how cheap is this story? Well: There are 24 Republicans and 17 Democrats on the committee. Democrats sit on the left, from the witness’s perspective; Republicans sit on the right. Here’s a screenshot from the moment Gowdy started speaking to Woods and Smith. There don’t seem to be 24 Republicans sitting down for this; there seem to be six of ‘em. So does Rep. Patrick McHenry not care about Benghazi victims? Does Rep. Thomas Massie not care about Benghazi victims? 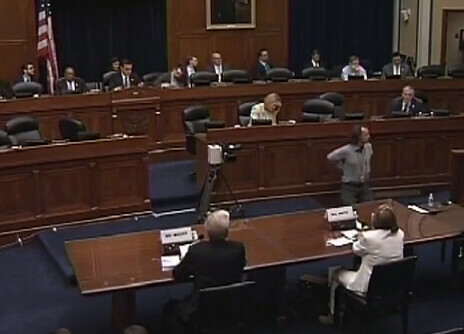 Does Rep. Doc Hastings not care about Benghazi victims? No, I’m sure they do, and they’ll vote for more investigations if they can, and whether or not they’re around for one hearing may not tell us much. Congressional hearing outrage-manship is not new, but it’s easier these days. Democrats turned Sandra Fluke into a star after she spoke in Congress and Rush Limbaugh attacked her; Democrats so successfully trolled Republicans on the bill that would have banned abortion after 20 weeks that the party chose a woman (Rep. Marsha Blackburn) to manage it on the floor, instead of one of the bill’s male authors. Issa’s goal here was to portray Democrats as callously uninterested in dead Americans, a ready-made outrage-builder, better for his cause than the actual investigative work the panel had done Thursday morning.